Special priced ensemble. 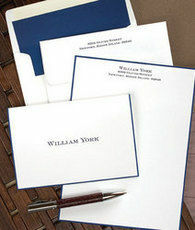 Set of 25 lettersheets sized 5.75" x 7.75" and 25 foldover notes sized 5.75" x 3.875". 50 blank envelopes are included. 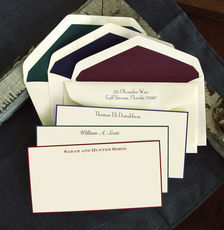 Optional envelope linings and printed envelopes available. Printed in your favorite raised ink color. Stock choice of white or ivory. Your choice of lettering style to be used. Positioning and format only as shown. Border, ink and envelope lining colors may vary due to the uniqueness of the hand applied borders.